Oddly, I’ve been more impressed by Nightmare than Lightspeed so far this year and Nightmare here racks up its second recommendation in as many issues. Even more oddly, I’ve been more impressed in general by February’s dark fantasy/horror than other fantasy or even science fiction and a story from The Dark is my only other recommendation so far this month. Swine Hill, basically nothing more than a pork processing plant, is already well on its way to becoming a ghost town with people outnumbered by, and many possessed by, the “Dead.” Kay is possessed by rage and vengeance after her father has died and her mother’s left, leaving her to raise her two siblings. Oscar is born and dies each day and Mira is rendered unable to speak of some great mystery or trauma. After a co-worker disrespects Kay and she wreaks vengeance on him, she loses her job. The domino effect from this runs through the family and town, bringing matters to a head. The characters are well-drawn, the dark fantasy/horror elements are powerful (especially the night in the bar and, even more especially, the morning after) and the dying town rings true. Up to that point, this is strongly recommended. After such an effective beginning with rising tension between the sisters, I personally felt the ending was too quick and incomplete and the last line was too easy. I feel like I see what it was going for and something it was trying to avoid and perhaps others will think the ending is perfect. For me, though, it results in only a mild recommendation. “The Crying Bride” is a monologue from an old woman who turns out to be the aunt of the listener. That niece is catching up on family history prior to her marriage to another woman and the tale she receives presumably shocks her. As the story opens, they’ve gotten to talking about ghosts and the aunt assures the listener that she doesn’t believe in ghosts because the family was never haunted by the one person who should have haunted them: the crying bride. What follows is a narrative of the lives and deaths on a family farm of a drunken uncle and his prematurely dead bride, a bitter mother, and a narrator who bonds with her special tree, flees to college to become “Janey Appleseed,” and returns to make even more of a difference than she already has. While this tale’s details are often surprising, the larger pattern is fairly predictable, but in the satisfying way of the recurrent rhythm of good familiar music. It’s also yet another misandrous tale but its problematic narrator so ironically and lightly delivers its darkness that it makes for a compelling read. 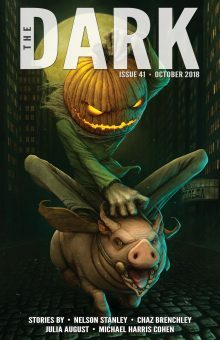 Ever since The Dark‘s pay rate change, I’d been considering covering it or at least looking at it and, between it appearing among the poll write-ins and the day being Halloween, I finally got around to doing at least this special holiday review. Unfortunately, this particular issue wasn’t great for me, though I can see the tales appealing to some. What she could do, though, was dukker better than anyone, twisting the threads of your hopes and fears into a life-line that she’d anchor somewhere so solid in the future that you felt you could drag yourself towards it, hand-over-hand, dangling above the awful yawning chasm of the possible. But it also contains awkward attempts to force emotion. I shan’t tell you of the next part: how weak she was, the rank smell of rot that clung to her; how light she was, gone bird-like in her bones, so that I more than half-lifted her from the bed, our roles reversed, as if I were the parent and she the child; the piteous weakness of her, the way that the life was nearly gone from her, the way she slumped against the trailer’s wall. I could do that. But I shall not. “Psychopomps” is another English tale of contagious traumatic loss (in this issue) and is another elliptical second-person present tense tale (in most all of most everyone’s issues) in which you are a woman heading through the outskirts of the London underworld, searching for your daughter with a guide who has her own issues. This is a nice idea that generates some nice mood but, despite its brevity, its narrative strategy and wandering nature make it feel long.